Inspired by my recent visit to Rouge salon in Ranelagh, I’ve been rifling through my nail polish collection to create my own New French manicure at home. I’m very pleased with this pale grey polish set off by vibrant magenta tips. It was really easy too, thanks to those Essence stickers below –- a tip from Aisling McDermott’s Gorgeous To Go. At under two quid, they were a real bargain but I was too impatient this time and my polish wasn’t dry enough before I applied them. This is where Sally Hansen’s Insta-Dri top coat came into its own – it smoothed out the ridges created when I pulled off the stickers, and salvaged what would otherwise have been a completely botched job. 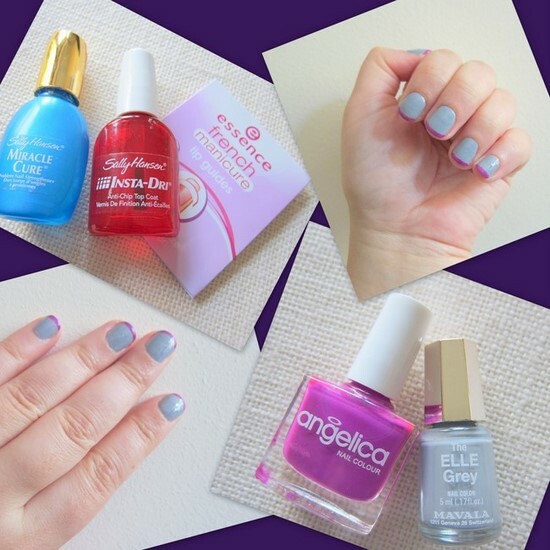 Angelica Nail Polish in Holiday Fun, available from Penneys, and Mavala's The Elle Grey, free with Elle magazine. Rimmel's Grey Matter or NYC's Sidewalker would also work well. I think I'll be trying out purple or navy nails with gold tips, next. How about you, would you try this and what colour combos do you think would work best? Let me know in the comments! ohh i love the coloured tip look, i think gold tips look really lovely with any colour. Thanks Zoe - I think you're right! They look fab! Those Essence tips are brilliant, love the Insta-Dri too. Our stupid Penneys never have any Angelica in!! I think black with a gold or silver tip would be gorgeous, must try out the Barry M foil polishes for this idea, hadn't a clue what to use them for up until now! This is a fab combination, and gold tips would be lovely with a dark colour. I will need to have a go at this if it is as easy as you say it is! 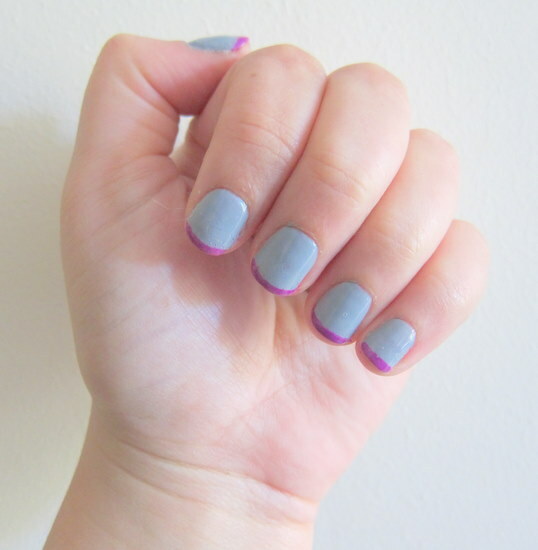 I was wearing almost opposite to this last weak - Pink nails with grey tips. It's so much fun and the colour combinations are endless.